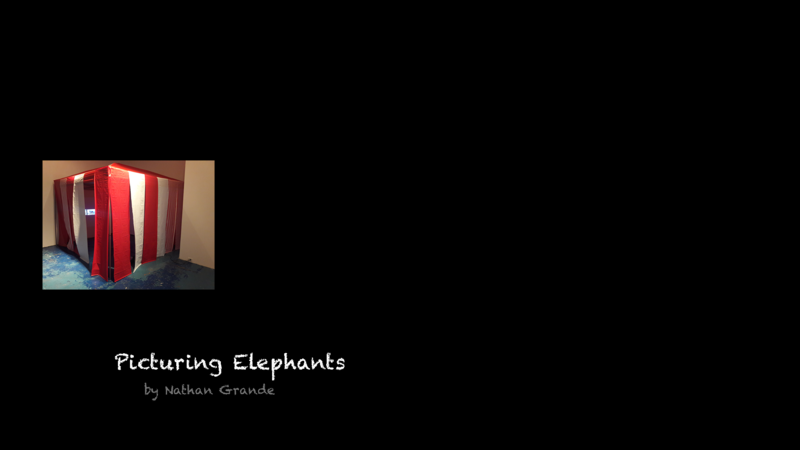 Picturing Elephants is an audio-visual installation. A curation of 67 internet images, an acoustic piano improvisation, and a sound-designed oration of a poem are assembled into a 3 1/2-minute video projection. The projection displays in a 10 ft. x 10 ft. canopy tent. 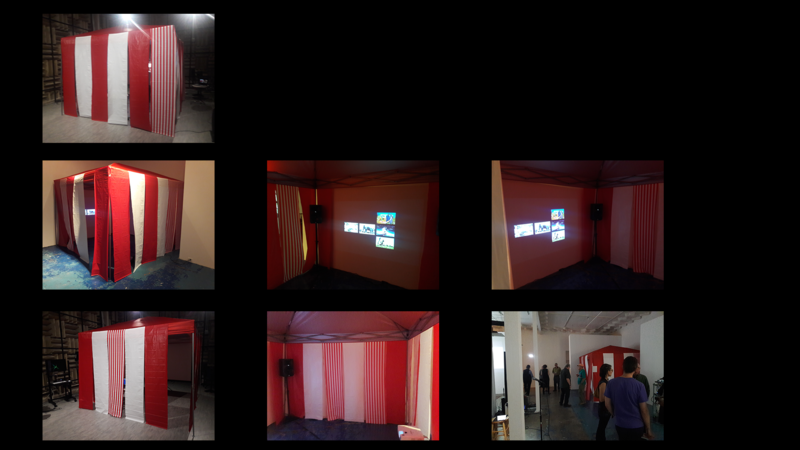 Red and white plastic tablecloth panels function as tent walls that reference the circus, while also putting the viewer-listener in a semi-enclosed space. The images highlight instances of spectacle, slaughter, abusive handling (“training”), captivity, and consumerism; and draw attention to the contradiction between sanitized visual representations of elephants and elephant-shaped artifacts, and the brutal mistreatment and destruction of corporeal elephants. Internet images rhythmically appear in synchronization with the rhythm of the piano improvisation, which accompanies a sound-designed oration of the poem Elephantidae: mother and daughter. The poem assumes the perspective of a female elephant who recalls the slaughter of her mother, while the piano accompaniment is a reminder of the historical use of elephant tusks as material to manufacture piano keys. I have created this installation for three reasons: to challenge the cultural consumption of elephants as entertainment; to create a memory of the plights of elephants–a memory that might later arise when one happens upon representations and spectacles of the elephant; and to inspire compassion for the elephant species, with a hope that personal forms of action follow.